In a recent Washington Post Weeknight Vegetarian column, Joe Yonan wrote about the recipes of Moosewood, an Ithaca, New York restaurant known for its vegetarian cooking. At first blush, peanuts in soup may seem strange, but they give this creamy, pureed soup a wonderful depth of flavor. Peanuts are a legume after all, albeit one we generally eat roasted. Due to some poor planning on my part, I further simplified the ingredients of this recipe by omitting the one celery rib and garnish of chopped cilantro (I just didn't have them on hand). Certainly, go ahead and add them, but it was still delicious as is. I added the garnish of chopped peanuts. 1. Heat oil in a Dutch oven or soup pot over medium heat. Add onion (and celery if using) and salt and sauté until softened, about 10 minutes. Stir in the ginger and hot sauce and then add the potatoes and water. Increase heat to medium-high and bring to a boil. Cover, reduce heat to medium-low and simmer until the potatoes are tender, about 15 to 20 minutes. 2. Add the tomato juice and peanut butter. 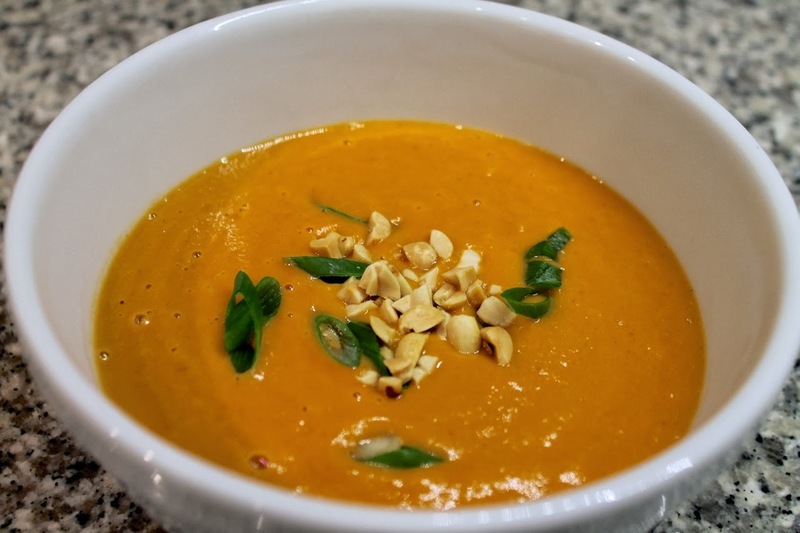 Use an immersion blender to puree the soup (or alternatively, transfer the soup in batches to a blender to puree). Serve in bowls topped with a sprinkle of chopped scallions and peanuts. Who thinks peanuts in soup is weird? Show me this person and let me set them straight. Or just feed them this delicious soup, I guess.